In a world where stereotypical designs are in abundance, we, the people of Dons, are the epitome of innovation and creativity. Our aim is to make sure that the moment you step into our establishment, you will be enthralled with our revolutionary ideas, the zenith of artistic brilliance. Though many would bare the false conception that interior products are merely lifeless possessions, we strongly believe the polar opposite. In our opinion, it’s manifestation of personal perceptions and expressive desire. It is engineered to be an extension of our customers, breathing life and comfort into the designs. our versatility surpasses all boundaries. So we guarantee that if you give us a chance you will not be disappointed. 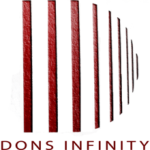 Dons Infinity Holdings (Pvt) Ltd.